2015 Birmingham: Cadbury World turns 25. Summer in Brum: Touchdown at Air Traffic Control. Birmingham Hippodrome was built in 1899 when Queen Victoria was still on the throne and has become one of the city’s most famous landmarks helping to make and shape memorable theatre moments for generations of visitors. Original silk programme from when the theatre first opened. 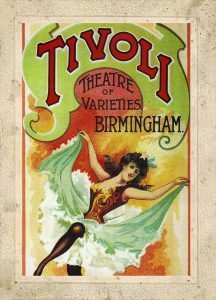 The theatre originally opened as The Tower of Varieties and Circus with a bill which included The Wonderful Brothers Clarke, Little Valdo – the Funniest Clown on Earth and Willie Richards – alias Rabbit. In later years it has welcomed some of the biggest stars in show business from Laurel and Hardy to Frank Sinatra, from Shirley Bassey to The Who and has gained a reputation for attracting the West End’s most famous musicals including Les Misérables, The Lion King, WickedandMiss Saigon. Birmingham’s cultural heritage: Birmingham Hippodrome. Summer in Birmingham: Project SoundLounge festival set to take the city by storm from 7th – 9th August.